This short-term pause in warming at the Earth’s surface is also consistent with climate model simulations. Research reported in 2011 by Gerald Meehl and his colleagues in Nature Climate Change found that decade-long periods of little or no surface-air warming are relatively common in climate-model simulations. 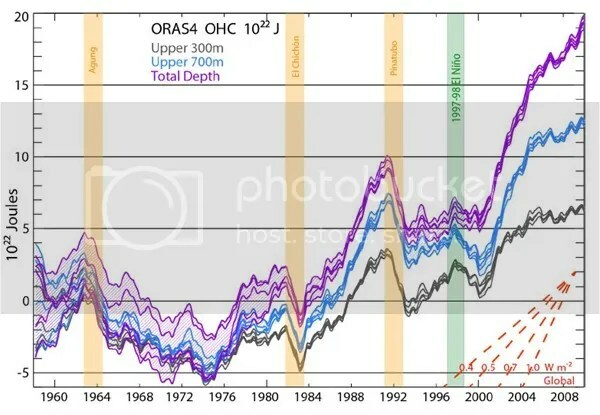 During these so-called “hiatus decades,” more heat is transferred to the deep oceans, consistent with the findings of the Balmaseda team. The next couple of years should probably provide us with enough new information to determine how temporary the warming hiatus of the 2000s was. If the temperature signal spikes in the 2010s, what will skeptics say? Everything is still completely natural?